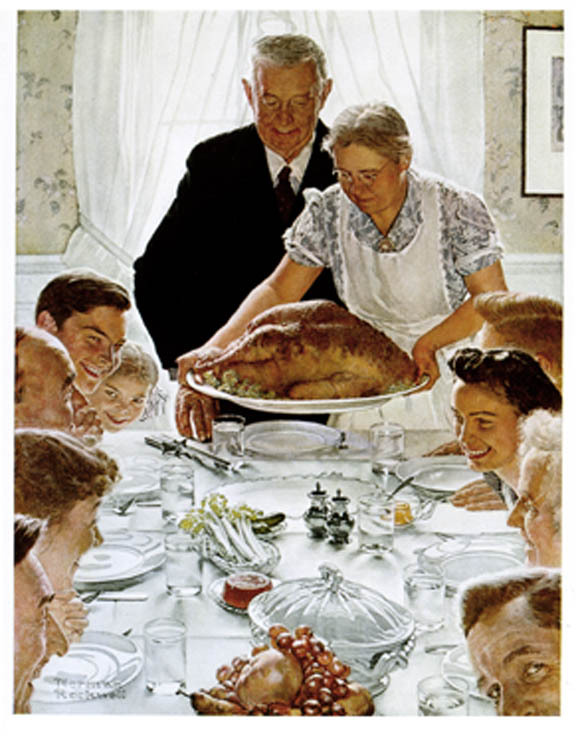 Half of the Sky: Rockwell's "lesser known" freedoms. FREEDOM FROM DOUBLE INDEMNITY...Meaning the people women who slave for two days making the Thanksgiving dinner don't have to be the same ones who do the dishes afterwards. FREEDOM FROM PAST SINS...Guarantees that just because you're breaking bread with your family of origin doesn't mean you have to be subjected to the endless litany of tired jokes regarding all of the foods you refused to eat as a picky 10-year old. The road to hell is still paved with fresh tomatoes (and their gelatinous innards) as far as I'm concerned and I don't have to apologize for it 30+ years later. FREEDOM TO IMBIBE..."Why-- yes--I believe I will have another glass of wine before Aunt Beulah gets here with her two incontinent lapdogs and her signature dish of Liver in Aspic." FREEDOM FROM TYRANNY..."Please...let's not pretend that your child's aversion to any non-white foods makes him Wolfgang Puck. Let's just call it what it is...strange...and leave it at that. And while we're at it...please have him take off that crown he's wearing while at the table." FREEDOM FROM BOREDOM...No one is allowed to take advantage of a captive Thanksgiving audience by inflicting vacation slides/photographs/family videos immediatley following dinner. FREEDOM FROM GUILT..."No..I haven't even begun to Christmas/Hanukkah/Diwali shop. Why do you ask?" FREEDOM FROM GUILT (PART II)... "Ditto for Christmas/Hanukkah/Diwali cards...or the pictures of our family that go inside." FREEDOM FROM IDIOCY..."Wait...you mean turkeys need to defrost BEFORE you cook/fry them?" FREEDOM FROM SOMEONE ELSE'S INFLATED SENSE OF SUPERIORITY... This year I refuse to sit quietly while certain family members use passive aggression to make comments about my house, my kids, what we eat, and any opinion we might have about anything. This year I'm eating with a tire iron under my chair and I'm not afraid to use it. FREEDOM FROM POLITICAL BRAWLING ON OUR SPECIAL DAY OF THANKS...If you refer to me as a Socialist I'm going to be forced to pull out the "F-word". That's right...FASCIST. See how quickly that levels the playing field? Now shut up, eat your carrots and stop ruining this day for everyone. And...no...we can't watch FOX NEWS while we eat. FREEDOM TO INDUCE DIABETIC COMA...So what if every single dessert is made from chocolate and there is no mincemeat to be found? What exactly is your point? FREEDOM TO CALL IT WHATEVER WE WANT...Dressing or stuffing? Dressing or stuffing? Does it really matter what they call it in New York? I don't think so...just as long as no one puts any oysters in it. Because...that's just wrong. Please feel free to add your own impressions here.